Pilgrims, who have traveled to Valencia, Spain, for centuries to genuflect before the Holy Grail — Jesus’ chalice — are thronging there now to take in another cup: the Holy Grail of sailing. The America’s Cup is heir to a long and proud tradition, but in this 32nd defense of the so-called Auld Mug, tradition is giving ground to commerce, which helps pay the bills for what is still a game for the very rich. 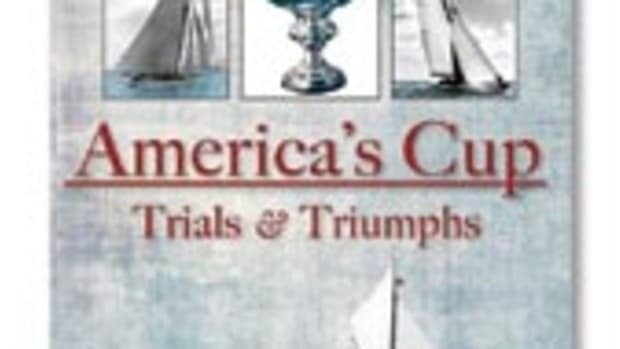 This is the first time the America’s Cup regatta will be raced in Europe since 1851, when the schooner America won the 134-ounce silver ewer in a race around England’s Isle of Wight. It also is the first time challengers and defender have raced in 14 “Acts,” or pre-Cup regattas, during the three years before the final competition. The changes, though dramatic, weren’t totally unexpected and reflect new realities in the Cup rivalry. The Swiss Alinghi syndicate, the defender this go-around, won the Cup from the Kiwis four years ago in Auckland, New Zealand. One of the spoils of victory is the right to choose the next Cup venue. The Swiss chose to bring it back to Europe — to the Spanish Mediterranean, because Switzerland’s Lake Geneva is landlocked — and do some tinkering to raise its profile. The cost of winning the Cup has soared to more than $100 million, which some say is way too much for a sports event that often has been staged mainly for aficionados — Cup die-hards, sailracers and yacht club insiders. Taking the Cup to Europe, where fans confer celebrity on sailors, and scheduling dozens of preregatta races in several cities is heightening interest, making it a better business investment and enabling more syndicates to get sponsorship to play the game, says sailmaker and North Marine Group CEO Tom Whidden, a 27-year Cup veteran. “I think it’s good for sailing, good for the spectators, good for people interested in it, and good for suppliers and sponsors,” he says. Cup historian John Rousmaniere agrees. “Myself, I think this is the best thing that’s happened to the Cup in years,” he says. Though purists may decry the Cup’s commercialization, Whidden says it still has all the elements of a great story and a great sporting event. “It’s not just about a boat,” he says. Nor is it just about commerce. It’s about a $100 million-plus campaign waged to win a once-every-four-year, winner-take-all regatta in which there is no second place. It’s about assembling a highly skilled and motivated team of managers, sailors, scientists, computer geeks, naval architects, sailmakers and boatbuilders, and putting them to work on a research project that runs up astronomical bills analyzing every inch of boat, rig and sails for even a 10th of a knot of extra speed. It’s about cleaning up the wreckage from collisions of big egos — billionaires and crackerjack skippers — and in the end it’s about winning races one-on-one, gladiator-style. Cup races still are match races that pit one syndicate and its boat against another and its boat. Easy to watch. Fun to follow. “To me, it eclipses all other aspects of the sport of sailing,” Whidden says. This from a man who is sitting out his first America’s Cup in 27 years. Not because he doesn’t find it exciting anymore — for those fortunate to be on an America’s Cup team, it is all-consuming. “I have a job. I have a family,” he says. A spectator now, Whidden plans to travel to Valencia to watch the racing from the sidelines and get a taste of Spanish hospitality in a port city whose working waterfront has been turned into a pleasure boating Mecca. The Spanish government has spent $637 million on a 700-slip marina, a Cup village — Port America’s Cup — and a 34-acre park where a half-million fans can gather and watch the racing on giant television screens. “They’ve done a wonderful job with the America’s Cup village,” Whidden says. “I’m impressed. It shows what a Cup can do for a city.” Valencia, population 800,000, expects a $1.5 billion return on its Cup investment and 10,000 new jobs for its people. The lineup going into the Louis Vuitton challenger elimination series April 16 to May 7 comprises 11 syndicates from nine countries: the United States, New Zealand, Italy — which has fielded three challenges — Spain, France, Germany, Sweden, China and South Africa. The winning challenger races against defender Alinghi in the America’s Cup June 23 to July 7. By all accounts, Alinghi’s well-oiled machine is still a juggernaut, even without its winning skipper Russell Coutts. Alinghi owner and billionaire Ernesto Bertarelli fired Coutts, the winningest Cup helmsman ever, in a dispute over who was in charge of key decision-making — Coutts or his boss. Coutts hasn’t lost a race in three Cup regattas, sailing first with Team New Zealand in 1995 and 2000, then with Alinghi in 2003. Bertarelli has replaced Coutts with two other crack helmsmen, American Ed Baird, the world match-racing champion, and the U.S. Virgin Islands’ Peter Holmberg. Both still were vying for the job in February. Coutts is sitting out this Cup — part of an out-of-court settlement with Bertarelli — but expect him back for the next one, hungrier than ever to win. Alinghi has dominated the Acts, the pre-Cup match and fleet races sailed in Valencia; Trapani, Sicily; Marseille, France; and Malmo-Skane, Sweden. The Acts don’t count for the Cup, but they do give challengers and defender a chance to feel each other out, and points won in the Acts figure into the challengers’ seedings in the Louis Vuitton series. Alinghi finished third in the 2004 Acts but got it together for 2005, losing just two match races in 33 starts and winning five of the six Acts for the 2005 championship. The syndicate finished second in 2006, still very strong, since it was the only one of the top four teams that was racing an old boat. Each syndicate is allowed to build just two new boats. Alinghi planned keep the challengers in suspense, test its new boats against each other, and race the best one in the defense. “Alinghi hasn’t been racing their fastest boat, and still they’re winning these Acts against Oracle and [Italian syndicate Luna Rossa],” says Paul Cayard, winner of the 1992 Cup challenger series on the Italian boat Il Moro di Venezia. He says Alinghi has to be the favorite going into the defender series. Whidden agrees. “I don’t see anyone at the moment who could beat Alinghi easily, but I could be surprised,” he says. The top seeds among the challengers after 12 of the 13 Acts were Kiwi Grant Dalton’s Emirates Team New Zealand, with 125 points; American software tycoon Larry Ellison’s BMW Oracle, with 123 points; and Italian Patricio Bertelli’s Luna Rossa, with 118 points. That’s the way it looked going into the challenger series, but the top-seeded teams’ second boats are untested in racing, so the challenger standings could change quickly once they start battling in earnest. “My rule is never believe anything you hear or read about the America’s Cup until the boats are on the water and real racing’s going on,” says Rousmaniere. Americans won’t see many familiar faces. Cup stalwarts Dennis Conner, Whidden and Cayard are all sidelined, along with Coutts. Yet the Cup always draws extraordinary sailors and managers — helmsman Dean Barker of Team New Zealand, BMW Oracle’s Chris Dickson, Luna Rossa’s James Spithill; and managers Grant Dalton of New Zealand, Alinghi’s Brad Butterworth and Grant Simmer, and BMW Oracle’s Laurent Esquier. They all want to leave their notch on the Cup. So does this mean the Cup is no longer a race for the best boat design and technology? Absolutely not, says Esquier, BMW Oracle’s operations director and a veteran of 11 Cups. “A slow boat has never won the Cup,” he says. Cup historian Rousmaniere sees another possibility. “Good construction may be more important than design innovation,” he says. A yacht can’t win unless it finishes, and breakdowns are a hazard of Cup racing. But don’t expect any dramatic innovations, like John Bertrand’s winged keel on Australia II in 1983, or really lopsided contests between different species of boat. Remember the 1988 Cup, when New Zealand fielded a 134-foot monohull and Conner a rigid-wing catamaran? The America’s Cup Class Rule is designed precisely to prevent those kinds of wild mismatches — and to try to reign in spending, though it has not succeeded very well in that. Over the life of the rule, there has been a general narrowing of permissible design parameters, including fixed limits on hull displacement and sail area. Version 5 has been tweaked for the moderate offshore winds expected in Valencia. Displacement is reduced a ton, the keel is 100 mm deeper, and downwind sail area is increased 8 percent to “turbocharge” the boats — give them better acceleration downwind — to yield closer racing. America’s Cup management says the most lavishly funded teams invest 200,000 hours in brainstorming, computer testing, modeling and tank testing to put two new boats on the water. “Four years is a lot of time,” says North’s Whidden. “You spend a lot of money developing the best boat that you can.” A boat may cost “just” $5 million to build but many, many times that to design, model and test. Though hull shape is fairly well standardized after 18 years of refinement, Whidden and others say an extraordinary amount of research and testing still goes into the “appendages” — fin, rudder and bulb — and getting just the right balance among the three. Enormous amounts of money also go into research into rigs and sails — reducing their weight so the designers can put more weight into the lead at the bottom of the keel to get more speed. Rigs and sails can be modeled and tested on a computer using flow analysis; fin, rudder and bulb are harder to test on a computer and usually require tank testing to replicate waves and pitching. A 25-foot tank-test model of a 78- to 80-foot ACC boat can cost $250,000, and a team can go through dozens of models testing combinations. South African syndicate Team Shosholoza owner Salvatore Sarno reports on the team Web site that his designers tank-tested 23 models and 200 different appendages before settling on the right combination for its boat, RSA 83. Whidden, whose company develops “aero” packages (rigs and sails) for Cup boats, says his R&D involves a lot of materials testing and working alongside high-technology companies — like aircraft manufacturer Boeing, automakers GM and Ford, and DuPont — to develop better glues, stronger and lighter-weight fabrics, and carbon and Kevlar components. Several noticeable design tweaks have surfaced so far in this Cup. Oracle BMW’s first boat, US 87, has a bowsprit — which no other syndicate has — and a mast stepped a little farther forward than those of its rivals. Some teams are using inflatable battens on their sails for durability and weight savings. “Batwings,” retractable arms located well up the mast, have appeared on boats to support the sail’s leech and help shape it upwind. Square-topped mainsails are gaining currency, and Jobson says he’ll be looking to see if any team figures out how to use a second rudder at the bow — a canard — in this Cup. Arvel Gentry, a retired Boeing aerospace engineer who designed the mast for Dennis Conner’s 1973 and 1977 (Freedom and Liberty) campaigns, says Cup designers in his era borrowed computer tools from the aerospace industry to analyze fluid dynamics — how water flows around a hull and the way air streams around the sails and rig. These tools have been refined, taking into account the effects of waves on a hull’s movement through water and how variable wind speeds at different heights affect a sail’s performance. “This really has improved over the last 20 or 30 years, adjusting the tools to real-life applications,” Gentry says. Building boats for the Cup still fosters cross-fertilization of technology between industries. San Francisco-based BMW Oracle, which built its two boats at its own shipyard in Anacortes, Wash., commissioned Janicki Industries, a technology firm that makes composite parts for aircraft, to build the tooling and molds for its Bruce Farr/Juan Kouyoumdjian-designed carbon fiber hulls. Ellison’s Oracle Corp., the software design firm, supplied database software to store the enormous amount of information that its research generates. Sponsor BMW assigned three of its structural engineers to the design team and supplied simulation software ordinarily used to help design the carbon fiber chassis of its Sauber Formula One racecar. The software analyzed the hulls and optimized the composite construction for strength, rigidity and weight savings. BMW also built the boats’ steel fin keels at one of its German plants. BMW “has been a tremendous resource that has raised the bar on the technology side for us,” says syndicate spokeswoman Jane Eagleson. The multimillions spent on Cup R&D bring innovations that eventually trickle down to more garden-variety pleasure boats. “The cruising day sailor won’t get a huge advantage,” says Whidden. “But anyone looking for performance out of their sailboat will get an advantage out of what we learn in the America’s Cup.” Composite hulls, carbon spars and rigging, Kevlar and Mylar sails, deck hardware, and navigational and tactical software are refined for Cup racing and adapted to the marketplace. Choosing a crew with the right skills and chemistry is an art, but the talent doesn’t come cheap anymore. In fact, it is one of the biggest Cup costs today, says BMW Oracle’s Esquier. His syndicate numbers more than 140 people. Alinghi, which is almost as big, assembled three complete Cup-caliber crews for training and crew selection for the June defense. Gentry says in his time most team members were volunteers — people who loved the Cup for the sport, the science, the excitement, the education, or for all of those things. Today most are professionals. A Cup skipper or helmsman commands a salary of $200,000 to $1.5 million a year, Cayard says, and most of the syndicate is on the payroll for four years. Good people are expensive, but if they work well together they are worth it. A good team has “incredible value,” he says. Nearly 1.5 million people came to see the first 12 Acts, and America’s Cup Management — the company founded to run the event and structure it on a more business-like basis — says some 1.3 billion people watched them on television before the serious racing even started. Altogether 6 million people are expected to turn out for the Cup. This has given it more clout as an international showcase of a nation’s prowess in sailing, technology, management and design. Among the 11 challengers, three countries — Germany, China and South Africa — are first-time Cup competitors. A syndicate from England, sitting out this running, has thrown its hat in for the next Cup. A Cup campaign is becoming more justifiable as a business venture, says Whidden. “As people see that it can be done now with sponsorship, we’ll see more and more countries playing it,” he predicts. Countries like China and South Africa see the event as an opportunity to join an elite club of nations with internationally salable expertise in sailing, management and technology. The Chinese syndicate — partnering with Le Defi, a French challenger in the last two Cups — has piggybacked on the Europeans’ expertise to train Chinese dinghy sailors to race America’s Cup boats and to design and build a boat at a new shipyard, McConaghy International, in Dong Guan, China. Whidden says the Chinese are committed to the Cup for the long haul to promote their technology and boatbuilding, and they could be a future threat. To build China’s boat, Australian builder McConaghy has partnered with JinLi, a Chinese firm that manufactures carbon composite sailboards, paragliders, bicycles, snowboards, kiteboards and aircraft parts. McConaghy says it plans to build more high-tech, composite raceboats at the China yard, which can build them for less than the Australians. Whidden expects the Cup’s international appeal to draw more nations like China, that are growing wealthier and have a burgeoning technology sector to mount future challenges to promote their businesses. His picks for future challenges: Malaysia, Russia, and maybe another Asian nation or a Middle Eastern country. Yet a really competitive Cup quest still is obscenely expensive, even for the billionaires: BMW Oracle’s Ellison, chief executive of the world’s largest enterprise software company; Swiss biotech tycoon Bertarelli, Alinghi’s owner; and Luna Rossa’s Patricio Bertelli, husband of fashion designer Miuccia Prada. Whidden ticks off the evidence of the soaring cost of an America’s Cup campaign: $2.5 million in 1980, $3 million in 1983, $15 million in 1987, $80 million in 1992 (when billionaire Bill Koch joined the fray). “Now it will be in excess of $100 million,” Whidden says. Jobson says the figure may be closer to $60 million. Cayard suspects BMW Oracle’s budget exceeds $200 million, with automaker BMW kicking in probably $80 million of that. That cost for a campaign still far exceeds its commercial value as a product. At the highest level, “It is still an event that is subsidized by private, wealthy people, like it has always been,” Cayard says. Three of the top teams — Alinghi, BMW Oracle and Luna Rossa — all have wealthy patrons, and the fourth, Team New Zealand, is subsidized by its government for $21.3 million. The value of a winning Cup campaign may run as high as $150 million, Cayard says. A challenger that reaches the finals of the Louis Vuitton Cup is probably worth around a third that — $50 million to $60 million. A title sponsor might kick in $15 million to $25 million a year, says Scott MacLeod, president of F10, a UK-based sports marketing firm. That leaves a wealthy owner to pick up the rest of the tab. As a practical matter, a serious Cup contender needs an owner with deep pockets anyway so that it can sprint ahead early with a well-funded R&D and hiring program while it markets itself to sponsors, Cayard says. Fortunately, Cup patrons usually aren’t in the Cup for the profit. “The wealthy syndicate heads are involved for their sporting interest,” Jobson says. Their commercial interest usually is secondary. It’s no secret how to do that. He says other sports have contained spiraling costs with salary caps and designated training seasons, and he would add to that one boat per campaign, a shorter racing schedule, and further movement toward one-design raceboats. The America’s Cup Management Committee has structured the 32nd Cup — with the Acts and a venue within driving distance of 300 million Europeans — to try to wipe out some of the red ink. Organizers expect that not just sailors but tourists and vacationers curious about all the hoopla will flock to Valencia in unprecedented numbers. This is despite the February arrest of a suspected member of the Basque terrorist group ETA who is alleged to have been gathering information about the America’s Cup venue — port installations, Cup ceremonies and events, and hotels, according to press reports. The 26-year-old reportedly was carrying false identity papers and information on how to make explosives. Valencia authorities had asked the Spanish government to augment security to the village, which already includes checks similar to those at the gate of an airport. This Cup more than any other has been designed from the outset as an event that the public at large can follow and enjoy. The sun shines 300 days of the year in Valencia — a boon for tourism. Whidden says the city is no Fremantle, Australia, where the wind blows like stink and Cup racing was always full-bore. But Valencia’s summer thermals are reliable, if sometimes shifty and light, usually blowing out of the southeast from late morning well into afternoon. Cup managers are crossing their fingers that the winds will be good enough for the racing to come off as scheduled so spectators won’t be disappointed. “The infrastructure — what they’ve built there in Valencia — is unbelievable,” says F10’s MacLeod. This, too, was very much a business decision. Aside from its spectator appeal, Port America’s Cup is a delightful place for team sponsors to host their executives, workers and clients. “Hospitality” — partying at the village, sailing on Cup boats during down time, watching the racing from a megayacht — is one of the big perks of being a team sponsor, he says. Valencia — chosen to host the Cup over Portugal’s Cascais, France’s Marseilles and Italy’s Naples — has built the village around its inner harbor, where the team berthing and bases are, along with a 42-slip megayacht marina. The 12 Cup boats will head out to the race course through a 2,000-foot canal, past a new 630-slip marina built behind breakwaters on both sides of the harbor entrance. The village abuts La Malvarossa, a waterfront promenade, and is anchored at the harbor entrance by the $46 million Sails and Winds, a glass-fronted building with restaurants, clubs, bars and a panoramic harbor view. “Overall, what they’re doing there has really raised the level of the event,” MacLeod says. The next venue will be challenged to do as well. What took America out of the Cup?